Are you looking for discount tickets to Davis Farmland? 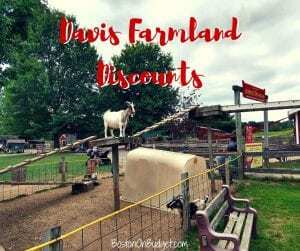 Davis Farmland is located west in Sterling, Massachusetts and a great day trip for young kids! In fact, you do need to be accompanied by children 12 and under to get into Davis Farmland Discovery Farm. Admission to Davis Farmland is $27.95 for ages 2-59 and $24.95 for adults 60+ during the summer months and admission is $22.95 for ages 2-59 and $19.95 for 60+ in the fall from September 6 to October 28, 2018. Free Admission Day: Mothers receive free admission on Mother’s Day, Father’s on Father’s Day, and Grandparents on Grandparent’s Day (September 9, 2018). Membership: If you frequent Davis Farmland, you can buy a membership for $150 per first member & $140 for additional members. Buy a membership for the 2019 season, and get the rest of this year free! We went to Davis Farmland last Friday and used the b1g1 coupon in the Entertainment Book as well as a free kids meal with adult entrée coupon. I think I paid around $10 for the book itself during a previous sale so still a good deal if I hadn’t used any other coupons in the book, which I did. A person in front of me had black and white b1g1 coupons that I couldn’t place so I’m not sure if they were library coupons (since my library doesn’t participate) or another coupon floating around, so keep an eye out! Also, let me know if you know what coupon that is or if you know of any other coupons, promo codes, or discount tickets! For more information about Davis Farmland, please head here. Is there a discounted price of you use your mass ebt card? You could always give them a call to double check but I don’t see it on their site or the EBT discount page. EBT cardholders can get free admission (up to 4) for Drumlin Farm in Lincoln though. It’s a little smaller than Davis Farmland and less activities, but super cute if you have kids and the animal selection is great and plenty of spots for a picnic and walk too!